Did John MacArthur visit the Lorraine Motel in the wake of the assassination of Martin Luther King, Jr.? Several times since at least 2007, MacArthur has claimed that he was with civil rights icons John Perkins and Charles Evers as they traveled to Memphis in the hours after MLK’s murder. MacArthur added that he stood on the balcony where King was shot and visited the house where James Earl Ray fired the shots, all within hours of the assassination. A February 4 NOQ Reports article skeptically addressed this matter using an interview with civil rights icon Charles Evers. In the report, Evers denied he went to Memphis that night with MacArthur. The NOQ Reports article quickly came under fire. Critics claimed it was biased and omitted some critical information. Due to the controversy and as a matter of historical interest, I became curious about the story and asked Phil Johnson, Executive Director of Grace to You (MacArthur’s teaching ministry), for additional clarification of several of the issues. He suggested I interview John Perkins. Ms. Perkins said that John MacArthur was a friend of Dr. Perkins and that was all they wanted to say but Charles Evers was accurate in what he said about the situation. To make sure that I understood Charles Evers’ position and that he did indeed make the statement attributed to him in the February report, I called and talked to him. 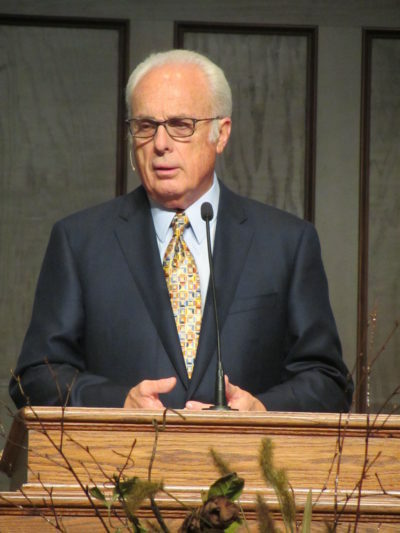 He repeated his claim that he did not remember John MacArthur, and he did not remember going to Memphis that night. He added that he might have gone to Memphis within days of the murder but he didn’t remember for sure. I asked for response or comment from Johnson and Rev. MacArthur (through Johnson) but they didn’t response by the time I published this. I will be happy to add any response they offer. Without a lengthier interview with Dr. Perkins, I still don’t know in detail what happened that night or if there was ever a trip to Memphis (within a week, a month?). Perhaps everybody involved has a fuzzy memory for the events of the time. In summary, when John Perkins’ representative had the chance to confirm John MacArthur’s story, she declined to comment; then she spontaneously affirmed the accuracy of the person who said it wasn’t true. This is what I can offer at this time. What it means is surely in the eye of the beholder. On several occasions, Rev. MacArthur has claimed he visited the crime scene where Martin Luther King Jr. was shot dead on April 4, 1968. This issue has taken on new urgency with the publication of an investigative report in NOQ Reports written by Rogers. Over several decades, MacArthur has described hearing about the murder of Martin Luther King, Jr. In essence, he has said he was in the Jackson, MS NAACP office of Charles Evers, brother of civil rights martyr Medgar Evers when a man entered the office and said King had been shot. At that point, several of the men including John Perkins and MacArthur traveled to Memphis to see the crime scene. MacArthur claims the scene wasn’t monitored and the men were able to inspect the King’s blood stains at the Lorraine Motel and examine the bathroom from where James Earl Ray fired the fatal shots. In Rogers article, Charles Evers is quoted saying he was in his car when he received word of the shooting. In the first edition of a book where he gives an account of the event, he says he heard of the shooting on the radio. In subsequent accounts, he said he got a call on his car phone. In any case, he was not in his office in Jackson. While this passage doesn’t place MacArthur and Perkins in Evers’ office (and a later account from Perkins doesn’t mention Evers), it does place them together. This information was not in Rogers’ article. A more important issue to me is whether or not Perkins and MacArthur went to Memphis that night (or at any time) and examined the crime scene. MacArthur has repeatedly said he did in the wake of the shooting even saying the security was lax which allowed them to go to the place where King was killed. This seems unlikely since a curfew had been imposed and reportedly security was tight at the Lorraine Motel according to available police records. The Rogers’ article did an admirable job of bringing this information together. I have emailed and messaged John Perkins via social media to ask him about his recollections of this night. He has yet to answer. In 2018, he told an interviewer that he was informed via the radio and community members after preaching. There was no mention of MacArthur, Evers or the NAACP office. I have been unable to find any mention in any of his books of a trip to the Lorraine Motel that night. 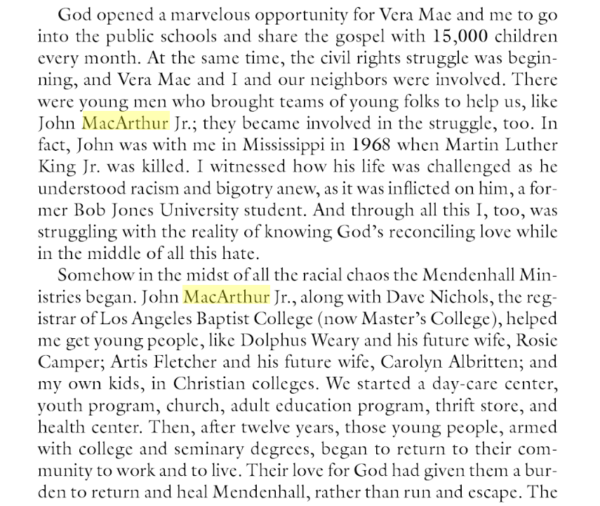 According to John Perkins, John MacArthur was in MS with him when MLK, Jr. was killed. I also believe that Evers was in his car when he heard about the death of King. I can understand how memory can reconstruct certain elements of an event. However, the trip to Memphis is another matter. I would really like to hear from John Perkins about what happened after he heard the news. The logistics of that night and distance between Jackson and Memphis make it seem improbable that MacArthur’s detailed accounts are accurate as described. I can’t judge the situation beyond that and am certainly not willing to say anything more with certainty without hearing from Perkins. Author Warren ThrockmortonPosted on February 5, 2019 Categories John MacArthurTags John MacArthur, John Perkins, martin luther king65 Comments on Did John MacArthur Visit the Lorraine Motel in the Wake of the Assassination of Martin Luther King, Jr.?